This cthulhoid Deep One comes to us from artist Jonathan Fuller. There's some beautiful texture work on the skin. 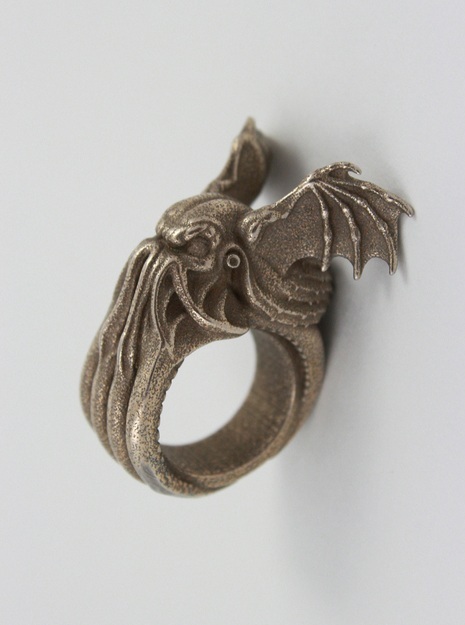 The JCGCCY collective brings us this nifty Cthulhu ring 3-D printed in bronze-infused stainless steel. The level of detail high end equipment is capable of is pretty amazing. Letchetane brings us this carved slate tablet based on the one created by Henry Anthony Wilcox in "The Call of Cthulhu". I'm tempted to call it Mignola-esque, but I think a better explanation is that both artists share a preference for clean, assertive designs. As the old joke goes, duct tape is like the Force in "Star Wars". It has a light side and a dark side and holds the universe together. The stuff is beloved by tinkerers across the globe because it's so damn handy. Wherever you find people fiddling around with stuff, you'll find duct tape being used and abused in ways it wasn't originally intended for. Except...that's not quite true. The shiny grey cloth backed tape we call duct tape was "invented" during WW II. At that point it was called "duck tape" because of it's waterproof qualities, and became a go-to tool for field expedient repairs in the military. It wasn't until the explosion of HVAC technology in the 1950s that workers started using it to seal forced air ductwork and the "duct tape" name came into widespread use. I put "invented" in quotes because the basic concept of duct or duck tape, a waterproof, cloth backed tape with a strong adhesive on one side, goes back well into the 1800s. 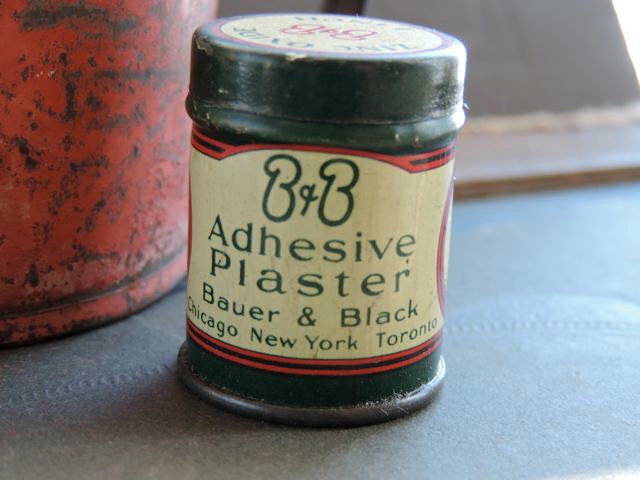 Back then the same basic product was called adhesive plaster or surgeon's plaster. 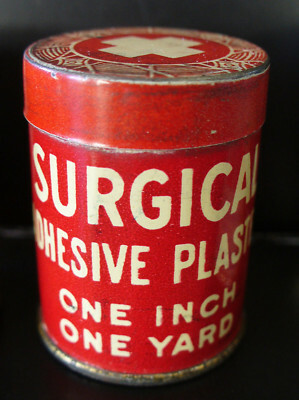 It was intended for binding bandages and wound dressings, but it didn't take long for people to realize it had a million uses. My own introduction to the wonders of adhesive plaster in the classic Mythos era came via the 1910 edition of Horace Kephart's "The Book of Camping and Woodcraft". He was a big fan of the stuff, recommending it as a valuable tool in a camper's kit. Adhesive plaster (zinc oxide plaster) can be bought at any drug store. Besides its regular use to hold a dressing in place where bandaging is difficult (never apply it directly to a wound), and for protecting sore spots, such as a cut finger or a blistered foot, it is a lightning repairer for all sorts of things. When warmed it will stick to any dry surface, wood, metal, glass, cloth, leather, or skin. 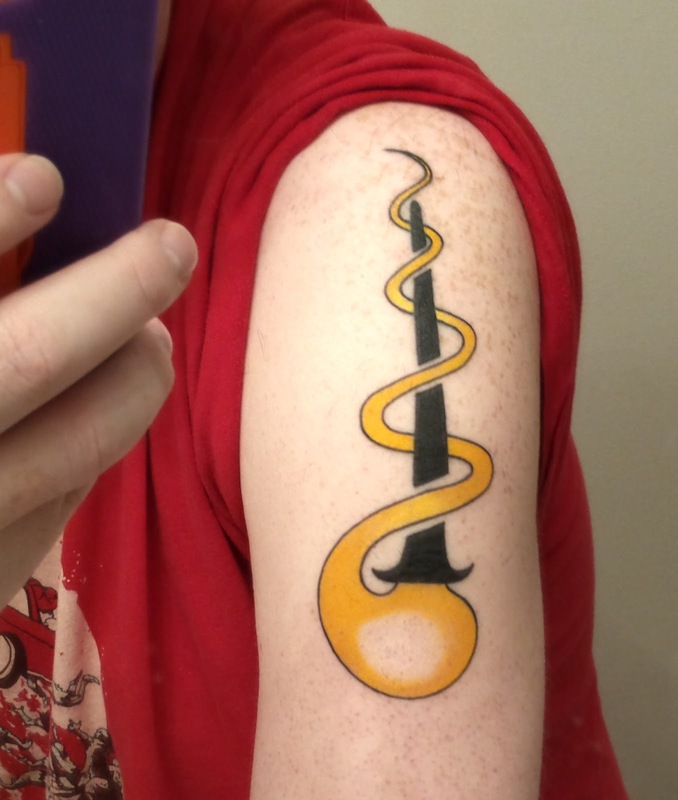 It can be peeled off and reapplied several times. As an instantaneous mender of rents and stopper of holes or cracks it has no equal. It is waterproof and airtight. With a broad strip you can seal a box or chest watertight, stop a leak in a canoe (" iron " it on writh a hot spoon or stone) or mend a paddle, a gunstock, or even an axe-handle (first nailing it). A chest or cupboard can be extemporized from any packing box, in a jiffy, by cleating the top and using surgeon's plaster for hinges. Select from the following list such articles as you know you will need, and make a light wooden box in which they will stow properly. One of the most bothersome things in shifting camp is to secure opened cans and bottles from spilling. Surgeon's plaster does the trick in a twinkling. Put a little square of it over each hole in the milk can that you opened for breakfast, and there will be no leakage. To hold a cork in a bottle, stick a narrow strip of the plaster over the cork and down opposite sides of the bottle's neck. 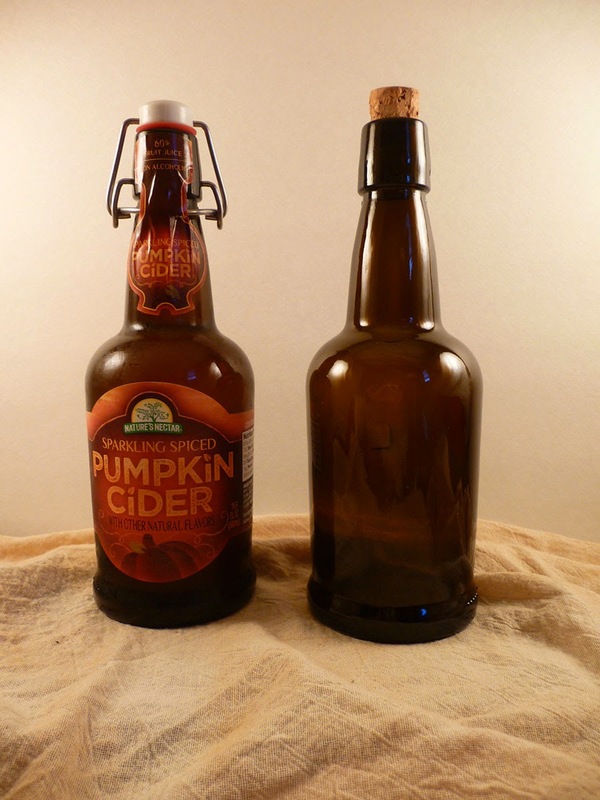 To protect the bottle from breaking, run a strip around it at top and one at bottom. The caps of baking powder cans or similar tins can be secured to the bodies in the same way. If your fishing rod sticks at the ferrules, wrap a bit of the plaster around each joint to give you a grip, then pull without twisting. 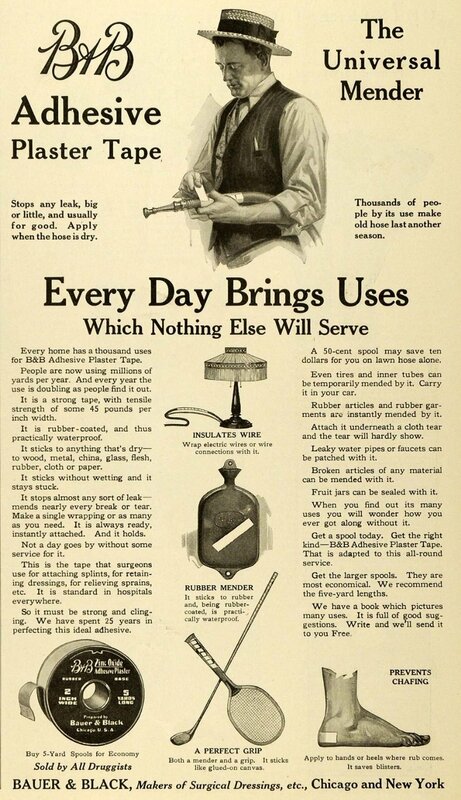 In 1910 "Good Housekeeping" recommended surgeon's plaster for repairing leaking pipes. In 1915 "Motorcycle Illustrated" had some handy tips on using adhesive plaster to repair grips, tie down cables, and fix flat tires. 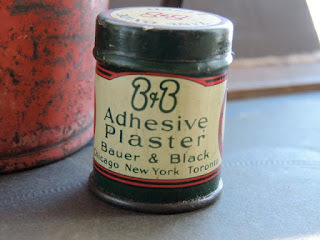 By 1918 Baur and Black, one of the leading manufacturers of adhesive plaster and first aid supplies, was featuring its all-purpose possibilities in advertising. I love stumbling across these little details of the early 20th century. It not only brings the period to life, but provides some interesting ways to add realism to props from that time frame. 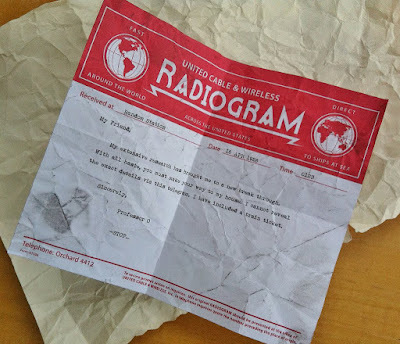 Claire Hummel brings us this nifty collection of items based on Disney's "Atlantis", created for a Valentine's Day gift exchange. 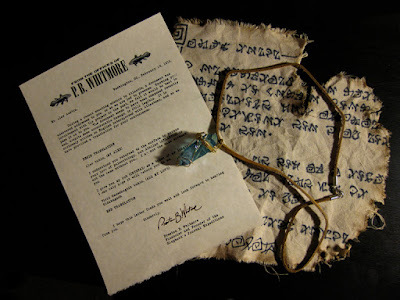 It includes a fragment of writing on cloth, the translation of same by the P. B. Whitmore character, and a blue Atlantean crystal. Cthulhu Fhtagn! Mid-South Effects Edition. 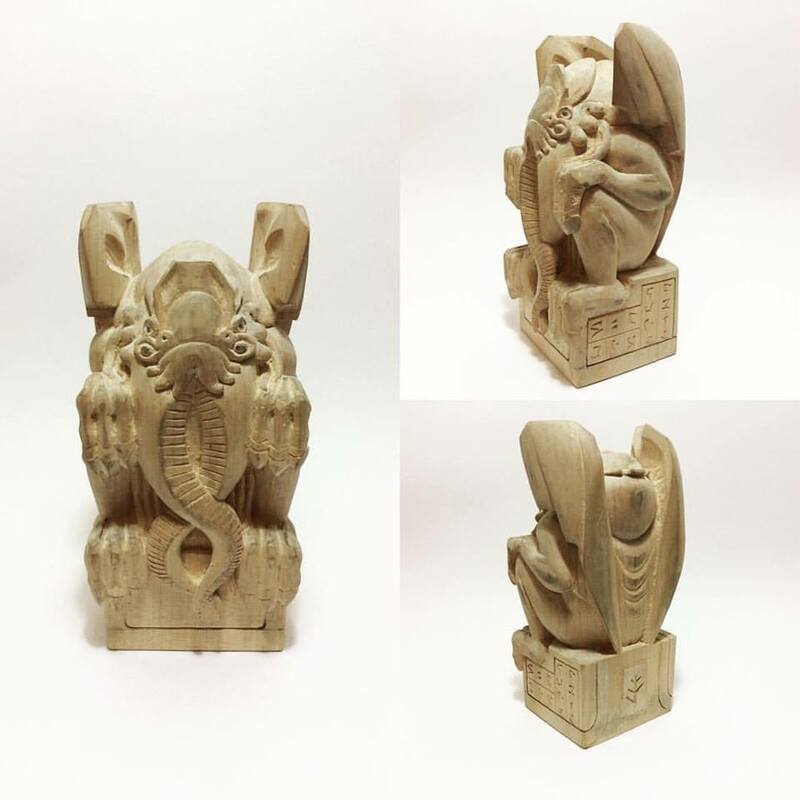 Over the years we've featured literally hundreds of Cthulhu idols, from one-off art projects to commercial runs with thousands of copies. 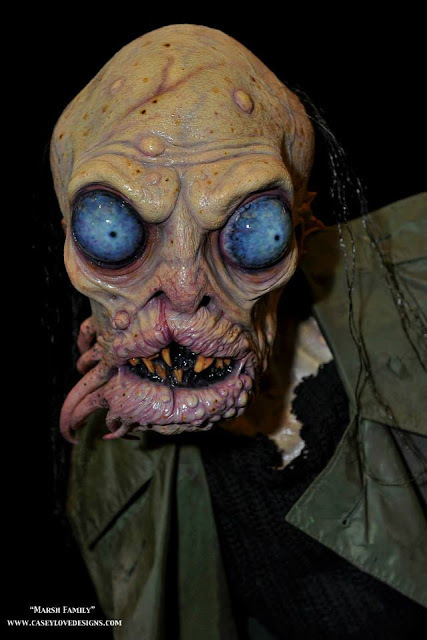 Out of all of them, this sculpt from Mid-South Effects is easily one of the best. 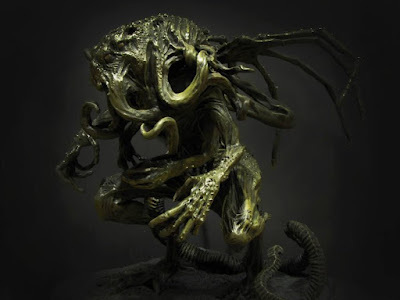 Not many artists have attempted a clean, stylized take on Lovecraft's creation because it's hard. 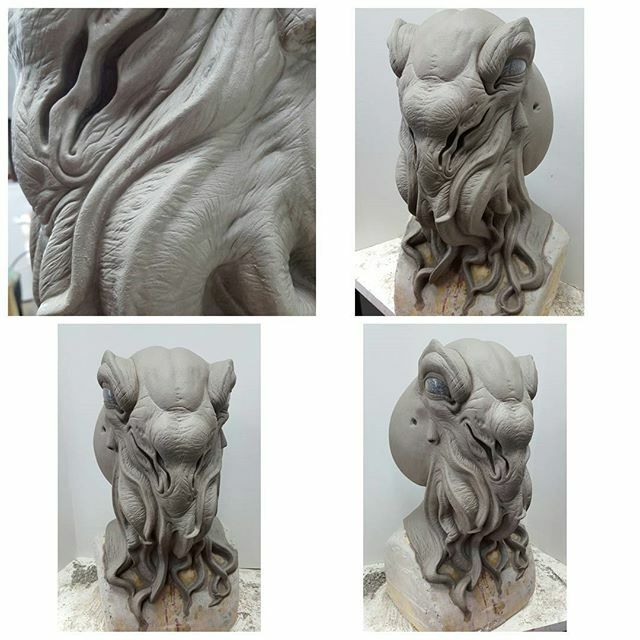 Smooth curves, mirrored symmetry, and geometric forms are some of the most difficult things a sculptor can do, because any flaws immediately jump out at the viewer. There's no surface texture or complex organic shapes to draw the eye away from minor imperfections. That's not a criticism of sculptors who create heavily detailed sculpts, just an acknowledgement that "clean" forms are very, very challenging. 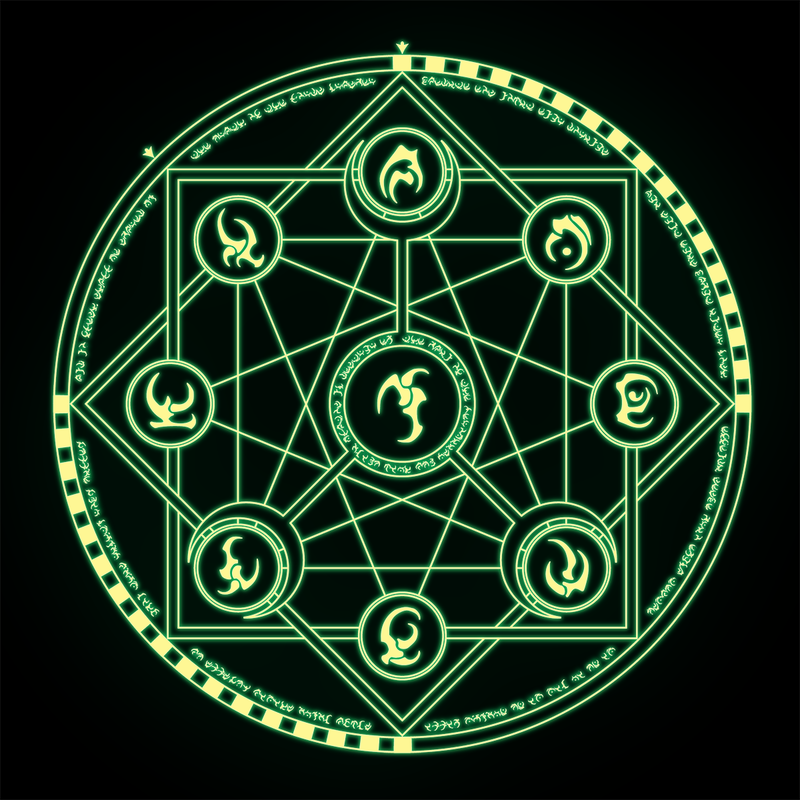 The only thing I'm not crazy about is the out of place Elder Sign on the base. That seems like an odd design choice. Update: Ghost0441 pointed out in the comments that this was actually carved from wood, making it even more impressive. 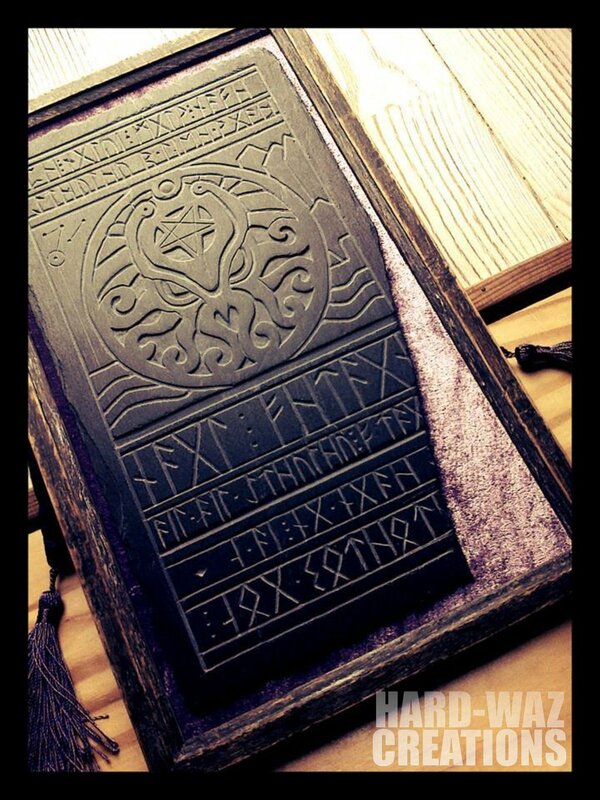 This wonderful faux artifact comes to us from artist Anthony Jegu. I always feel a bit guilty offering up an art piece on a props blog, but it takes a certain creative sensibility to create an objet d'art that evokes a sense of mystery and antiquity. This does that in spades. Just as a heads up, those very LARP friendly Spiced Pumpkin Cider bottles, and the cider inside, are back at your local ALDI supermarket. 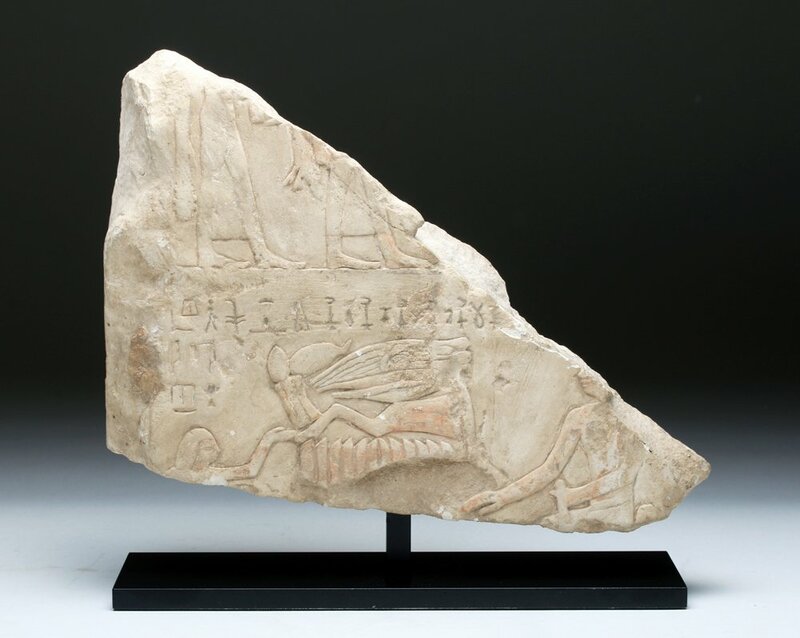 Egyptian, New Kingdom to Late Dynastic, Dynasties 20 to 26, ca. 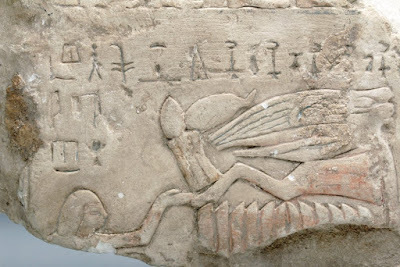 6th century BCE to 332 BCE. A rare stone stele fragment, the composition organized into registers as was customary, containing figural bas relief carvings as well as some heiroglyphic inscription. 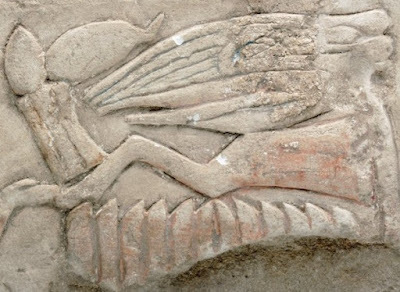 There is also a glyphic rendering on the right cross section of the piece. Steles were generally erected for funerary or commemorative purposes or to define borders and land boundaries. Offering a bit of context for this example, the text over the figure on the lower left with a raised hand translates, "The lector priest Ipiherheb." The text over the offering table reads, "A boon which the King grants, (consisting of) a thousand loaves of bread, a thousand jugs of beer, a thousand cuts of oxen, a thousand cuts of fowl, a thousand …" The next word can be either "alabaster" or "clothing", depending on what came next, but that part is missing. A magnificent and rare example! Custom, museum-quality stand. 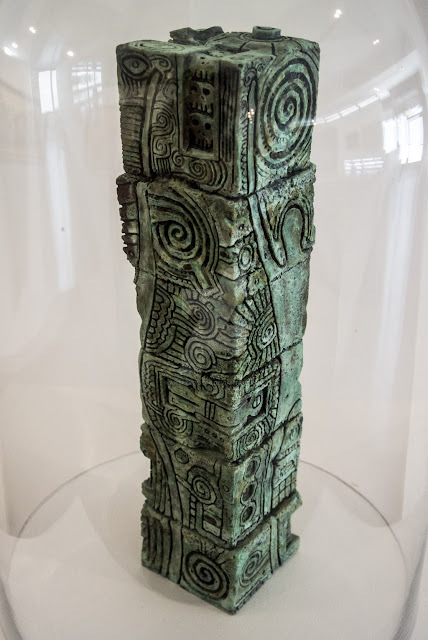 Size: for the piece itself, 10-1/2" (26.7 cm) x 8-1/2" (21.6 cm); on stand 9-3/4" (24.8 cm) H.
Provenance: Ex-private east coast collection, ex-private Professor Earl Ertman collection, OH, acquired 1970's. Earl L. Ertman retired in 1998 with over 30 years of full-time and several additional years of part-time teaching at the University of Akron. Besides teaching and excavating, he served as the Director of the School of Art for over 10 years. 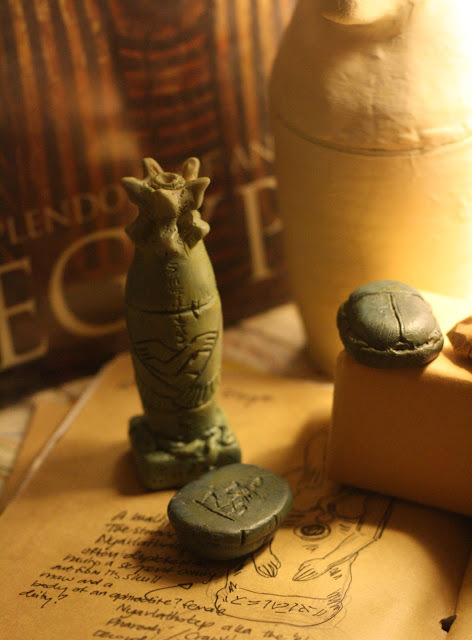 He has authored over 50 articles on Egyptian and ancient art. Are...are those multiple eyes? And a head filled with waving tentacles? Sweet fancy Moses, yes it is. How could no one have noticed this? 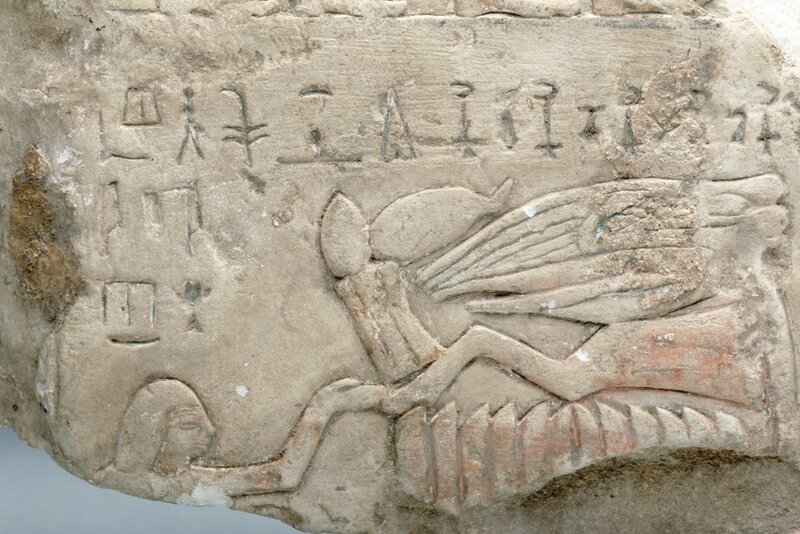 An Egyptian priest making an offering to the Great Old One himself? 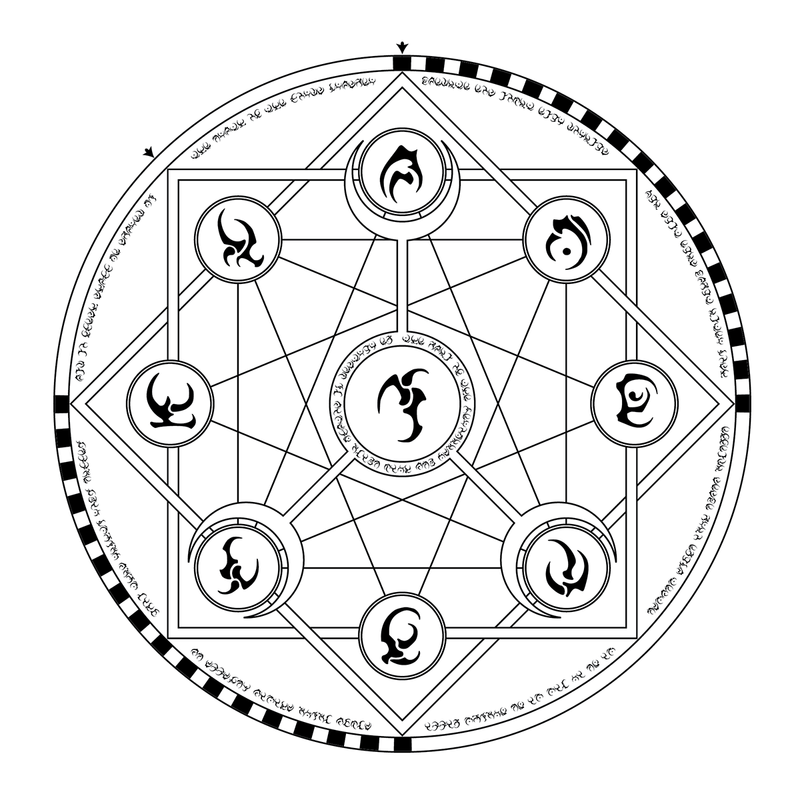 So much for Nephren-Ka being fictional. I'm sure there's a perfectly logical explanation for the Cthulhu-like figure, but I love when actual artifacts can be tied into the Mythos. 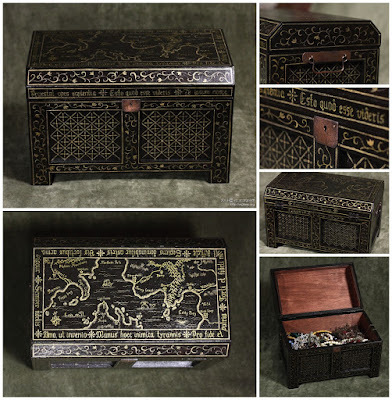 Ukrainian artist Ira Scargeear brings us this nicely done treasure chest. 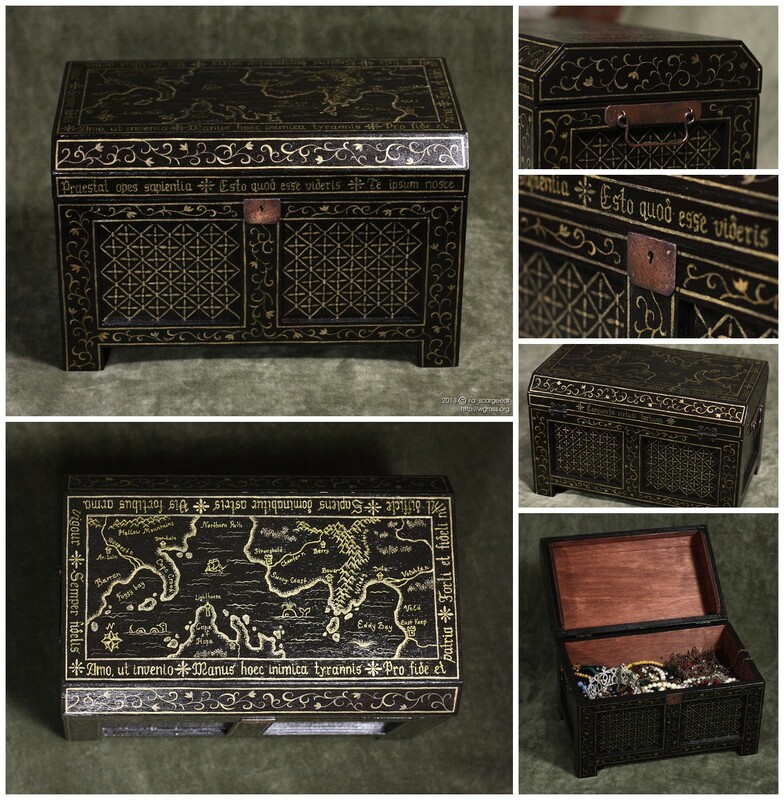 The trunk was commissioned from a professional woodworker and then handpainted, while the chest hardware was cut from copper sheet and wire. With a little patience and planning anyone could do something similar with the unfinished wood boxes available at craft stores. 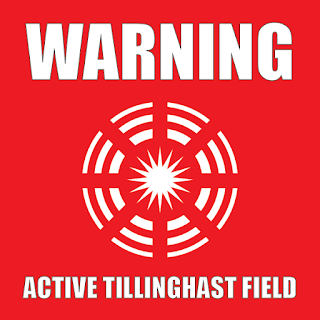 When you get a message like this you know something's going down. Michael R. Maranda brings us this intriguing telegram created using our customizable template. Artist Scott Valentine brings us this African expedition trunk, up-cycled from an old storage trunk. Browse back through the blog for a complete project log. Something like this would be awesome for storing props. If you're really cheap, just cruise the streets of any college town at the end of a semester to find trunks like this sitting on the side of the road. 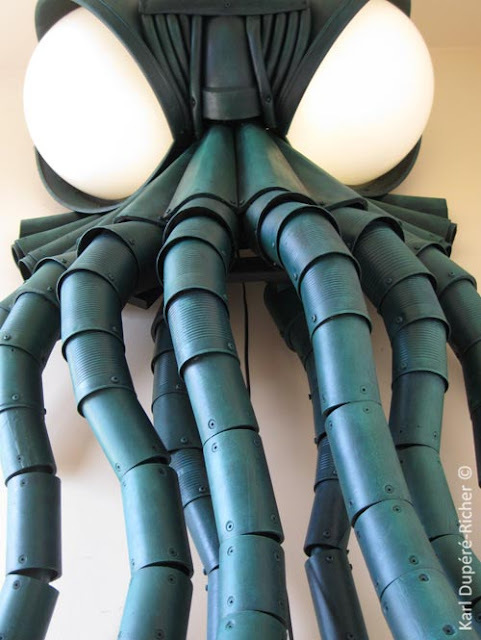 After far too long, the Mythos Mailbox is finally for sale. 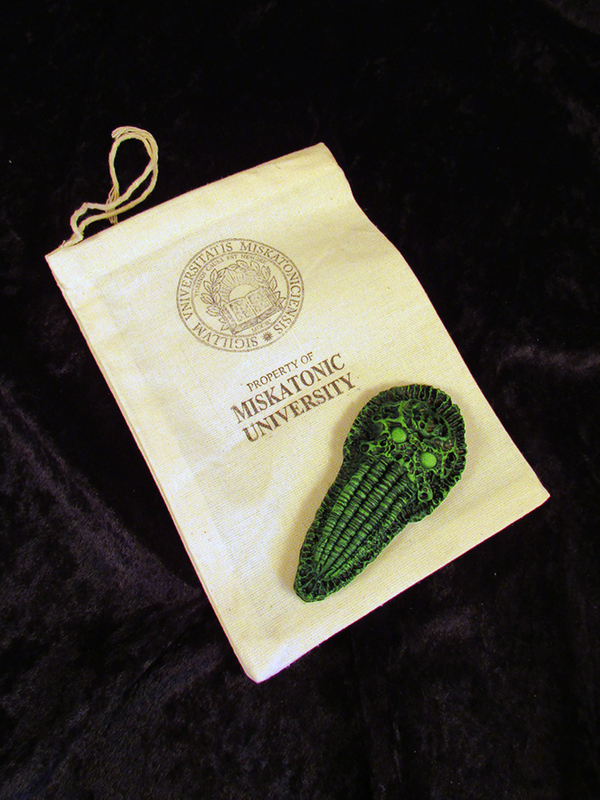 The set contains an original Cthulhu artifact, specimen bag for same, a pair of period accurate Arkham Library bookmarks, two Tillinghast Field warning stickers, a pair of Miskatonic University field journals, and a set of seven postcards. Right click on any of the pictures to open up a full sized version in another tab. 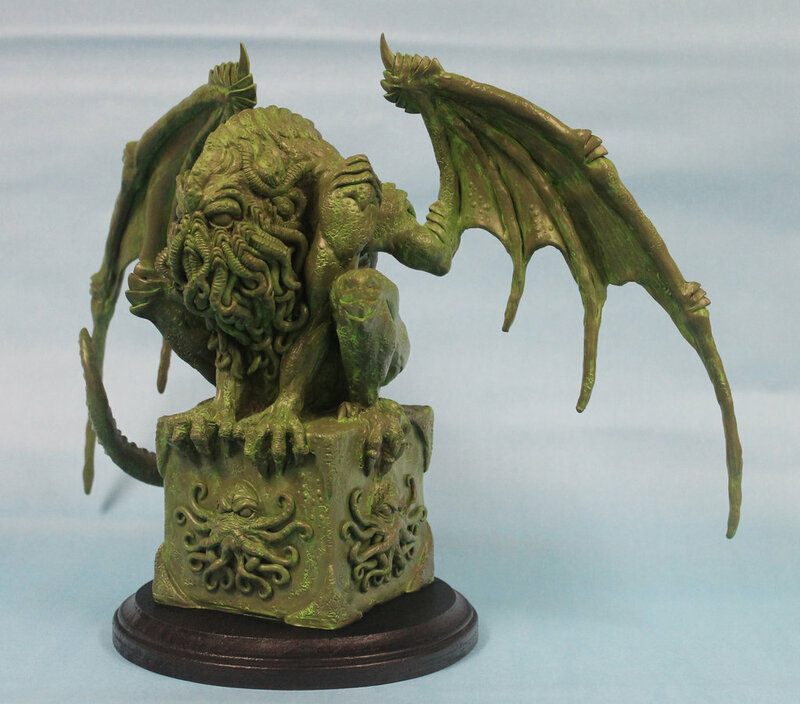 The faux stone Cthulhu artifact has a black and green finish and measures approximately 4" by 1 3/4". The specimen bag is roughly 4' by 6". 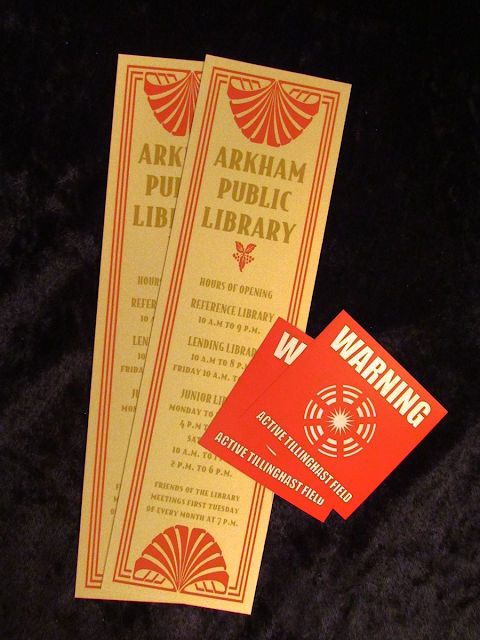 The Arkham Library bookmarks are 7" by 2", while the Tillinghast Field warning stickers measure 2" by 2". 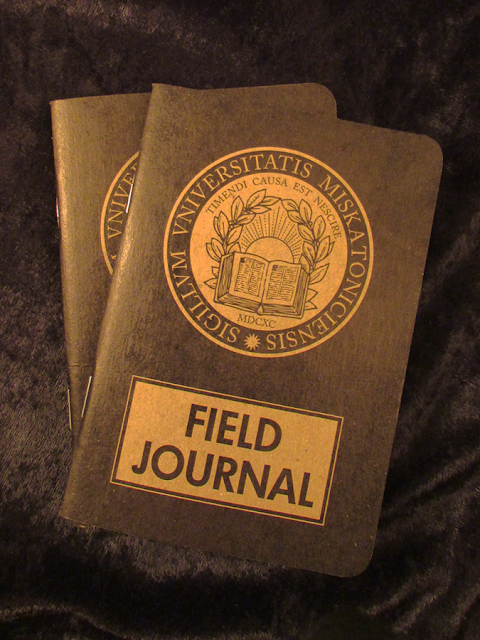 The field journals are patterned after the notebooks carried by scientists and researchers in the field. Each book measures 3.5" by 5" (8.89 cm by 12.7 cm) and has a saddle-stitch binding, 1/4" rounded corners, a heavyweight cover, and 32 pages of high quality lined paper. All materials are 100% recycled and the cover designs are printed with environmentally friendly soy ink. 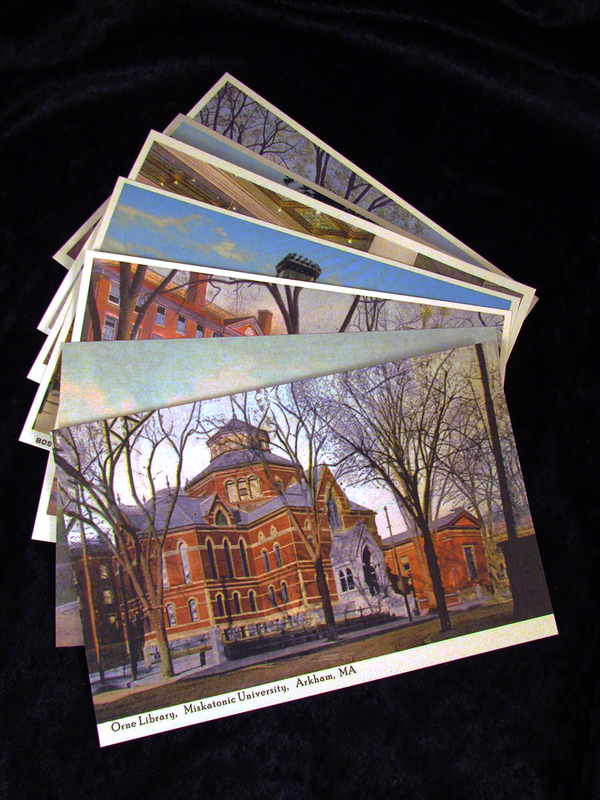 The set of seven postcards depicts a variety of Mythos locations, including the Middle Campus of Miskatonic University, the Lobby of the Hotel Miskatonic, Miskatonic University Front Campus, Arkham's Boston and Maine Train Station, two different views of Arkham Sanitarium, and Miskatonic's Orne Library. Update: Sold out! My sincere thanks to everyone who ordered one. 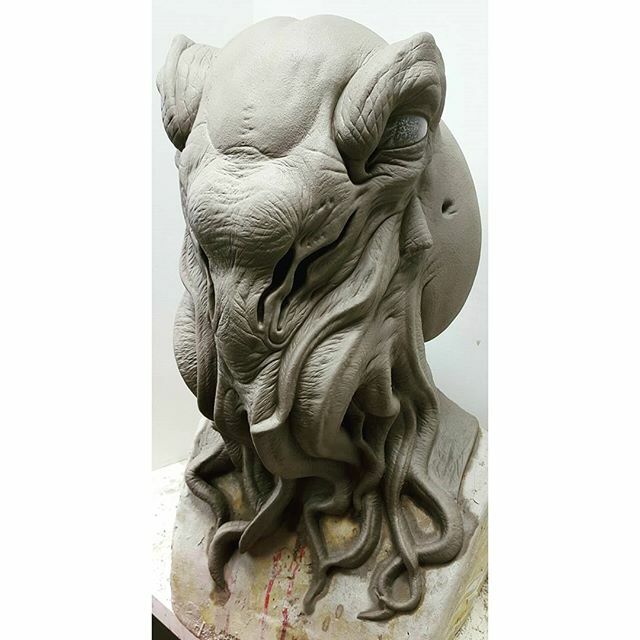 This impressive Cthulhu sculpt comes to use from Mexican artist JHRL. I like how he's captured the humanoid form without being overly anthropomorphic. The "Mythos Mailbox" will go on sale Saturday morning at 0600 Eastern. First off, does "Mythos Mailbox" seem like a good name? I've been trying to think of something amazingly clever to call it and that's about the best I've been able to come up with. I'm definitely open to suggestions. I'll have ten sets available for $35, Priority Mail shipping included. The complete package will include the long-in-gestation Cthulhu artifact, a specimen bag for same, two Arkham Library bookmarks, a pair of 2" Tillinghast Field warning stickers, a set of seven different postcards (reprints of all the ones I've offered before), and..some other stuff. I'll have pictures of everything up on Saturday. To be honest, I'd like to have it closer to $25 in price, but the costs of short run production just won't allow that. It's that whole boutique/big box store thing. When you're doing runs in the triple digits cost per item drops precipitously. When you're doing 10-20..not so much. If you think the price is out of line don't be shy about saying so. 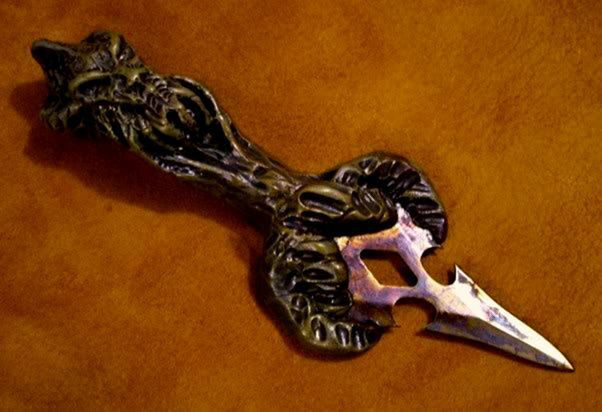 Mr. Zarono brings us this very nice artifact from the Cult of Dagon. 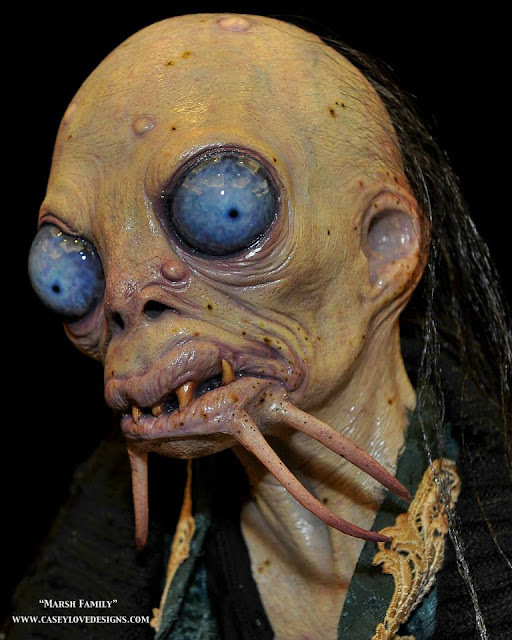 Say what you will about the Deep Ones, but they have a great design sense. 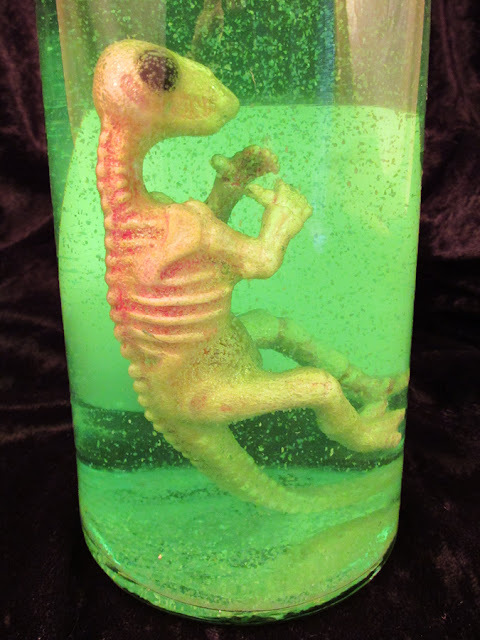 What would a mad scientist's lab be without some creepy preserved specimens? 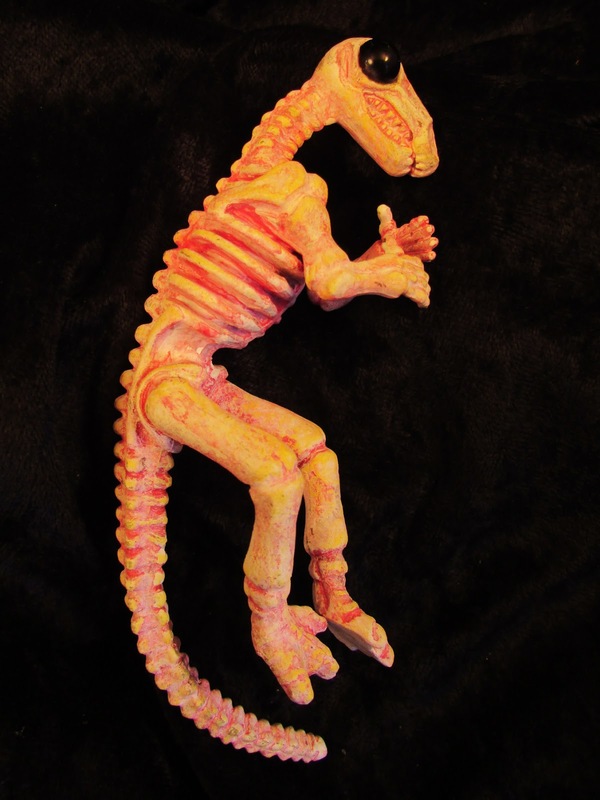 This project recreates the look of a diaphonized exhibit using a cheap toy dinosaur skeleton and some basic craft supplies. 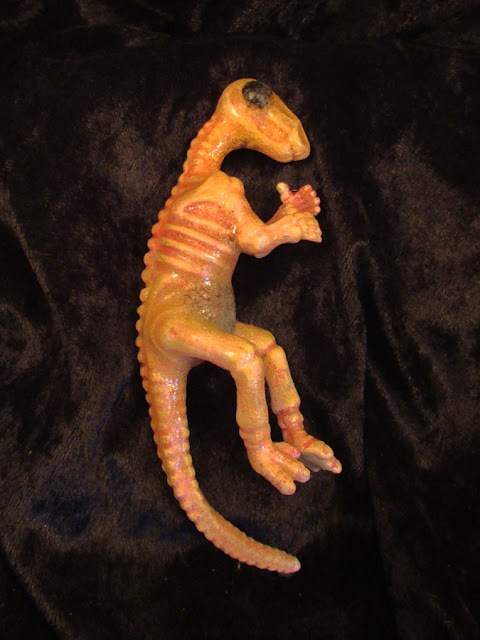 It's not movie quality, but from a foot away the finished specimen looks awesome. Not too shabby for something that costs around $2 to make. 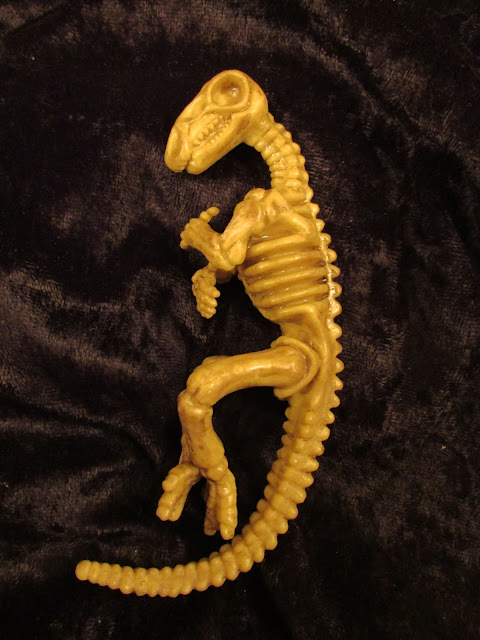 - Toy dinosaur skeleton. I used one from this set available on Amazon. They're less than $6 for a dozen, with free shipping for Prime members. - Black cabochons. These are the plastic hemispheres you find mounted in cheap jewelry. Once again I went through Amazon, ordering a package of 500 cabochons in various sizes. Enough critter eyes for a lifetime! You can find slightly cheaper sets on Ebay, but they usually have to be shipped from China. - Craft paint. I used white, pink, and deep red craft acrylics. - Gloves. 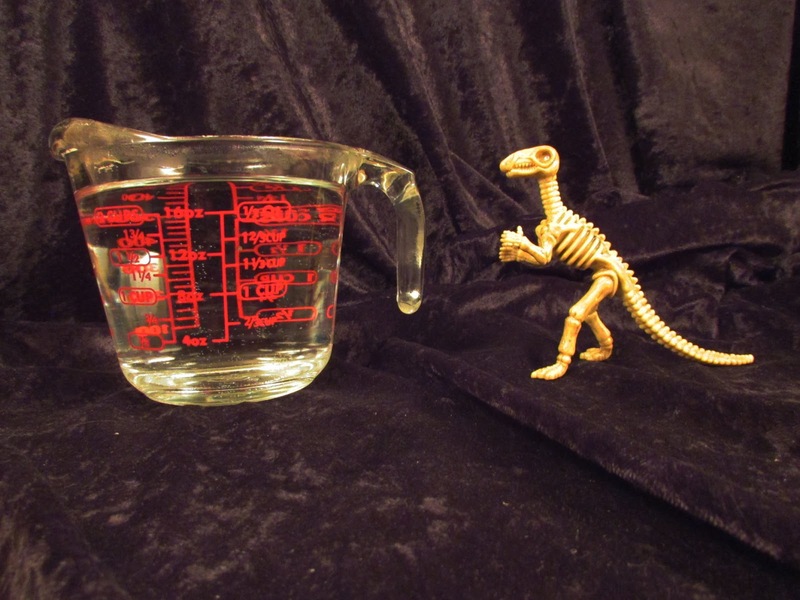 You'll be dipping the plastic dinosaur into near-boiling water. To protect your hands I'd suggest both a pair of latex or nitrile medical gloves and some cheap work gloves to insulate your hands. 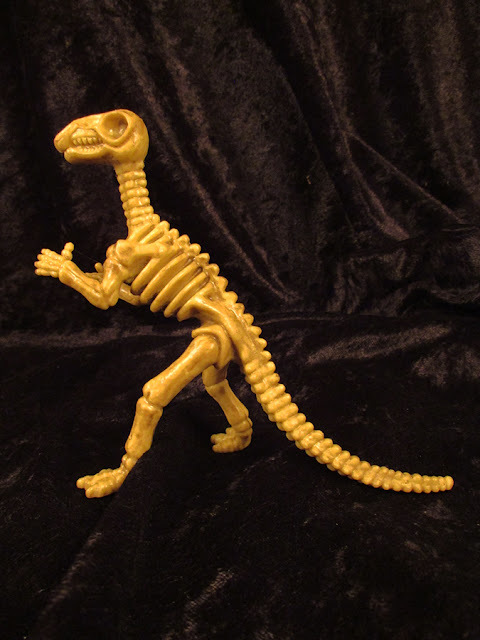 We start off with this basic plastic dinosaur. It's pretty cheesy, but the sculpt has a surprising amount of detail. You'll be reshaping the toy figure into the fetal position. The easiest way to evenly heat the parts you're bending is to dip them into a measuring cup full of water heated to boiling in the microwave. The plastic becomes rubbery and flexible at around 160 degrees Fahrenheit. That gives you about five minutes of working time as the water slowly cools off. Keep in mind THIS STUFF IS HOT. REALLY HOT. THIRD DEGREE BURN HOT. To protect your hands put on the medical gloves and then don the work gloves. The outer gloves will help insulate your hands from the heat, while the inner layer prevents any hot water from coming in contact with your skin. It's reasonably safe if you have a modicum of common sense. In a second container you'll need cold water, preferably with a few ice cubes. Dip the dinosaur into the hot water and bend the limbs into shape. Then plunge the toy into the cold water and the plastic will instantly set. To lever the feet and hands into position you may need to use a pair of pliers. Work on one limb at a time and you can bend the skeleton into almost any shape you want. Here's what the toy will look like once you're done. ...we're going to cover the figure in rubber cement. The result is a transparent fleshy layer that adds a ton of visual interest. Just brush on the cement, allow it to dry, and then repeat the process until you're happy with the effect. In the belly area I hot glued some bits of scrap latex to suggest internal organs and then applied a thick layer of rubber cement to build up a distended abdomen. And there you have it. Drop the critter into a jar of colored water and you have a great bookshelf display. In the finished specimen up at the top of the page I added two drops of green food coloring. The floating particulates are a sprinkle of garlic powder. It gives the fluid a nice grungy appearance as well as being an anti-bacterial agent. 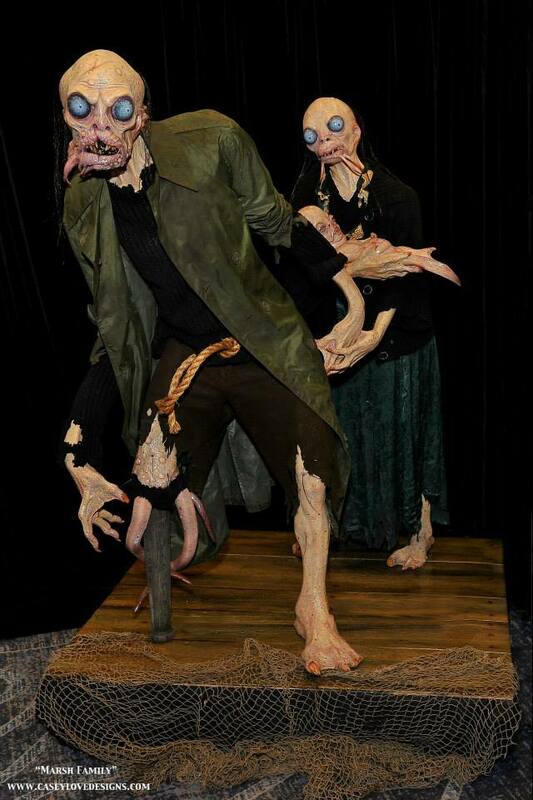 This amazing Deep One family tableau comes to use from artist Casey Love. It's a great take on the hybrid residents of Innsmouth, and all the more impressive because it's life-sized. 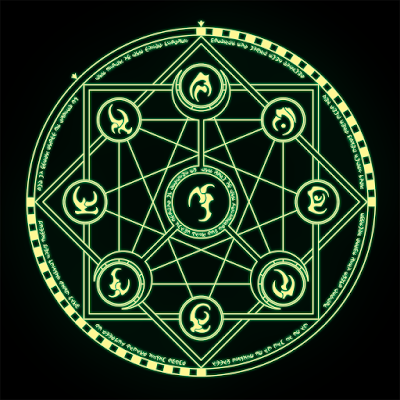 Part of me wants to win the lottery so I can have this on display in my house, but the shock of repeatedly seeing this in the middle of the night would probably kill me. My long delayed package finally arrived today, after spending nearly a week in Pittsburgh. One can only imagine what it went through while being held captive. Now that everything is here I'm planning on offering the set on Friday. That will give me time to get some nice product shots. 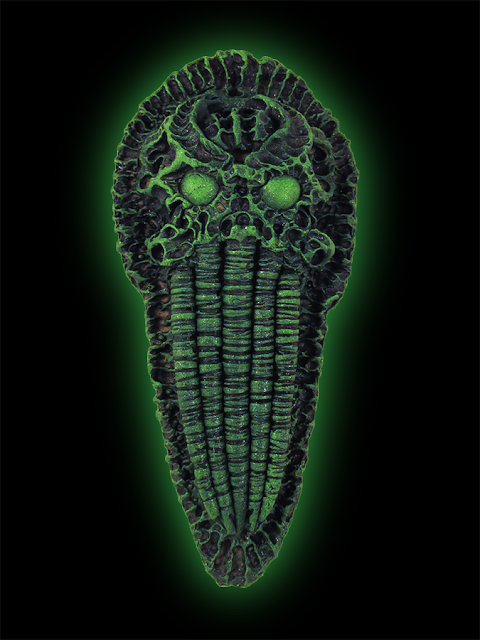 In the meantime I've been working on a nifty little gaff project for Halloween that I think you're going to like. If everything dries tonight I'll have a tutorial up tomorrow, but I may have to delay it until Wednesday. 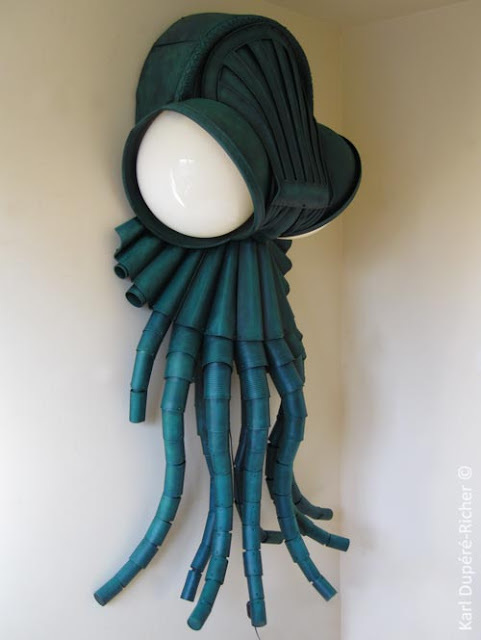 Cthulhu lamps are one of those Mythos geegaws that I normally don't have any interest in, but this one from Karl Dupere-Richer is gorgeous. I'm a sucker for deco-style designs and it has just the right blend of symmetry, curves, and detail to hit all my buttons. Here's the kicker- it's roughly 1.5 meters high and made from junk like patio chairs, PVC tubing, and garden hoses. 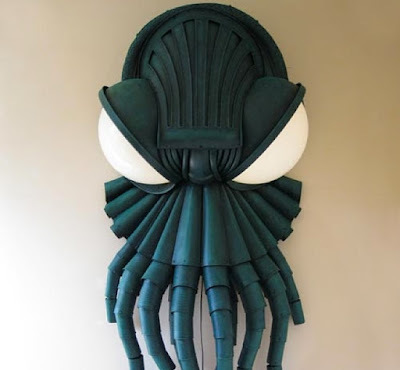 Sweet fancy Moses, this would look awesome on the wall for Halloween. 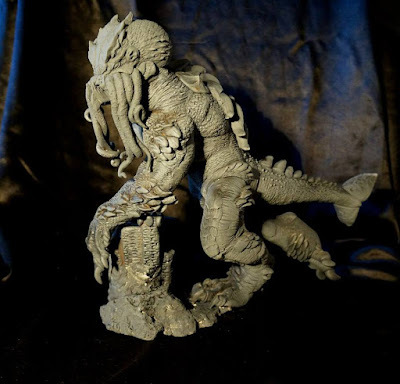 Artist Shawn Nagle brings us this kaiju-style Cthulhu figure. In an alternate universe a man in the full sized rubber suit version of this concept battled Godzilla, or possibly the Power Rangers. I can't quite decide if that idea is three flavors of awesome, or absolutely terrifying. 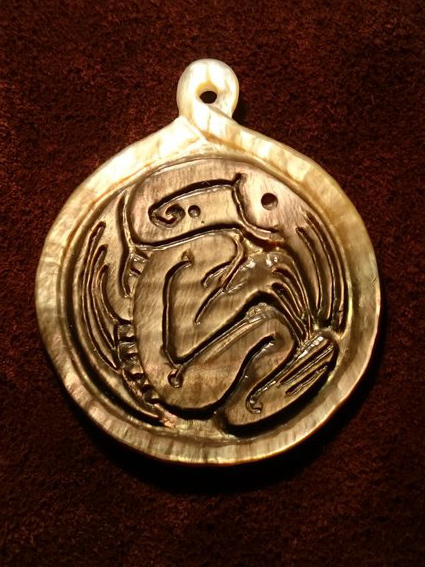 Vallhallarts brings us this nicely done Cthulhu pendant carved from real mother of pearl. 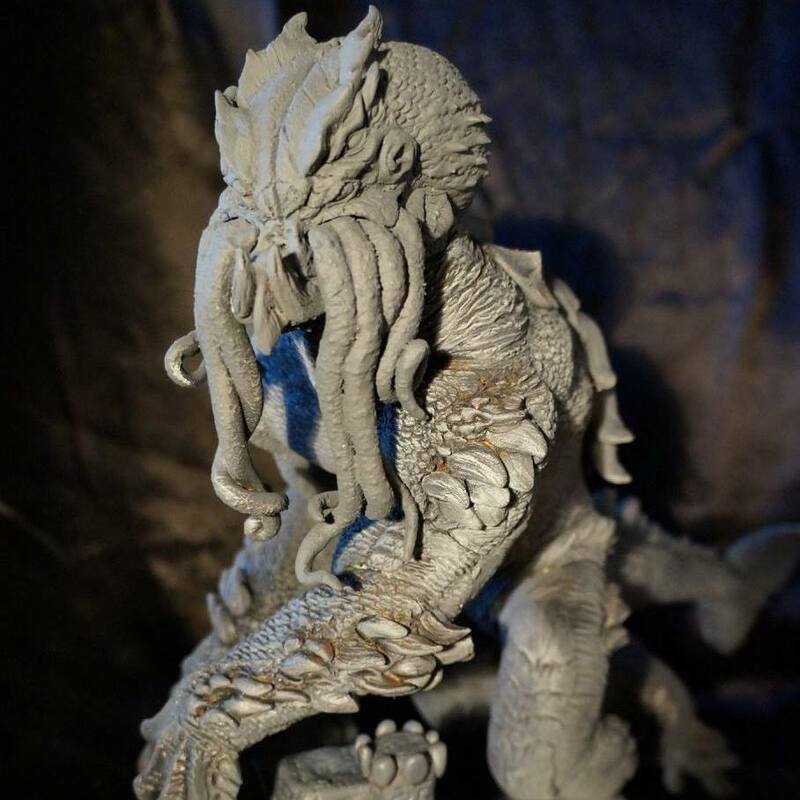 I love polymer clay and resin pieces, but appropriate natural materials take Mythos works to a whole new level. 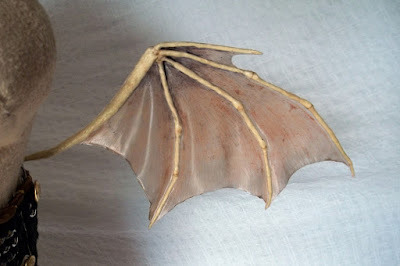 Miel Jolie has a great tutorial on creating a pair of costume dragon wings. What I really want to draw attention to is her technique for creating the wing membranes with Mod Podge. It's a brilliant idea, perfect for making fins and wings for creature gaffs. I was planning on offering up my first prop set in years tomorrow, but that's not going to happen. 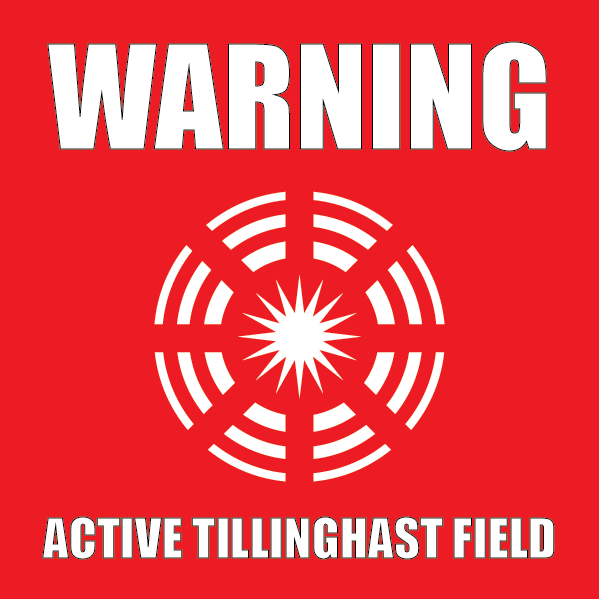 A package containing Arkham Library bookmarks and Tillinghast Field warning stickers has been sitting in Pittsburgh for two days. At the earliest they'll get here on Saturday. If so, I'll have the package available on Monday or Tuesday. Delays like this are why I'm so paranoid about having things in-hand before I offer them for sale. Ideally, I'd like to offer a short run of 10-12 sets on a Friday, mail them on Monday, and have them in your hands by Thursday at the latest. Quick and simple. 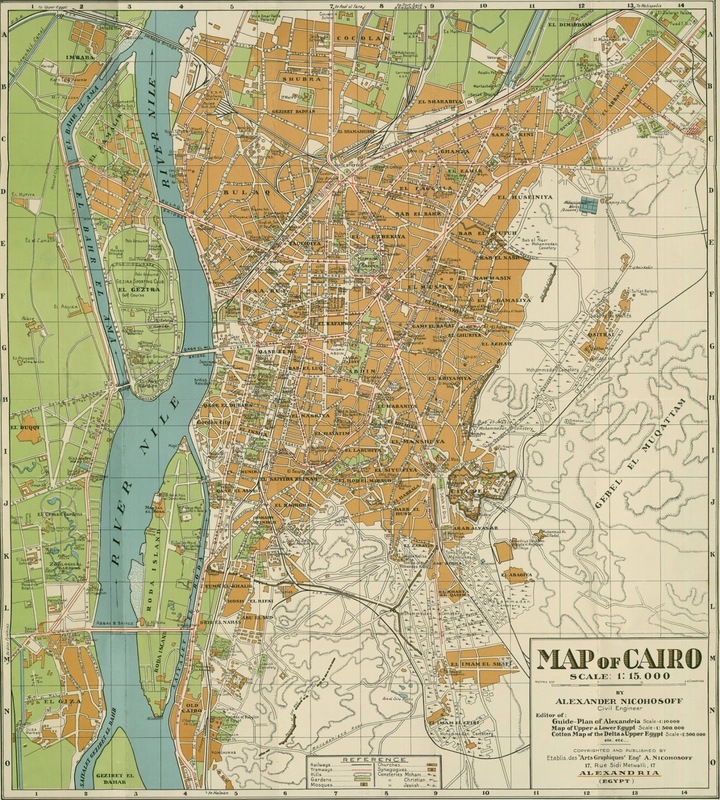 Wikimedia has a beautiful vintage map of Cairo by cartographer Alexander Nicohosoff. It dates to 1933, but would be ideal for any classic-era adventures in the city. Point of special interest at F-5: the Egyptian Museum of Antiquities. ... we halted at the great Gare Centrale ["Main Station" at C/D-7/8]. ... whilst the very theatre where I was vainly requested to play, and which I later attended as a spectator, had recently been renamed the "American Cosmograph" [period program; now the Cosmos Cinema, still at E-7]. At length Abdul took us along the Sharia Mohammed Ali [F-8 → I-9] to the ancient mosque of Sultan Hassan [I-9], and the tower-flanked Bab-el-Azab [the original *gate* of Saladin's Citadel], beyond which climbs the steep-walled pass to the mighty citadel [J-10] that Saladin himself built with the stones of forgotten pyramids. 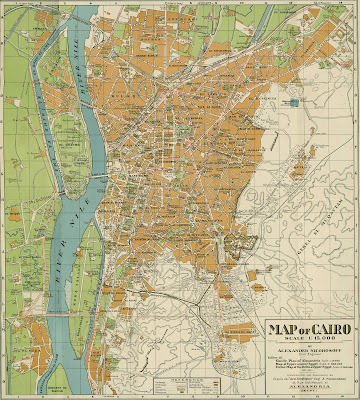 It was sunset when we scaled that cliff, circled the modern mosque of Mohammed Ali [K-11], and looked down from the dizzying parapet over mystic Cairo — mystic Cairo all golden with its carven domes, its ethereal minarets, and its flaming gardens. I was sorry to hear Shaun Gentry won't be doing a run of these, but the finished piece is quite nice. Projecting wings on an idol like this are always problematic, since there's so much risk of them being damaged during shipping. Michael Shreeves isn't waiting until the stars are right to declare his allegiance. His flesh now bears the Yellow Sign, courtesy of tattoo artist Matt Shiflett. Daryl Toh brings us this curious archaeological find from an unidentified Egyptian tomb- a shabti that appears to depict an Elder Thing. One wonders how many Mythos artifacts like this have been overlooked by scientists unaware of their significance. 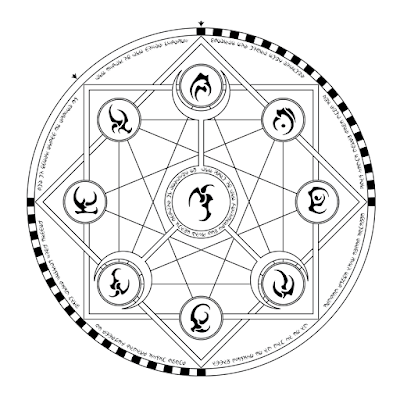 Another piece of magic circle clip art for use in paper props. Just right click and open in a new tab for the full-sized version. It's a clean image, so you can apply weathering and effects, as in the example below, as you see fit.